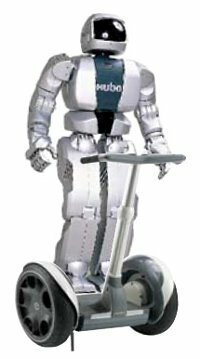 Professor Oh Jun-ho of the Korea Advanced Institute of Science and Technology announced that his walking robot Hubo will be getting a Segway to scoot around on. Hubo will be the first robot to get on Segway and control the scooter. This is just the latest innovation from the Hubo Labs. Albert Hubo is a version of the robot that sports an animated Albert Eistein head. Albert has been appointed as the official ambassador of 'Dynamic Korea.' 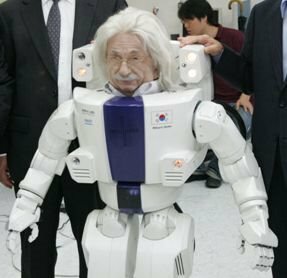 He has been seen gallivanting around the world lately trying to catch up to the popularity of his Japanese rival Asimo. Albert Hubo has reportedly signed a deal with pop-star Kanye West to perform in a music video for the 3-man band Sara on their debut album later this year. When asked about the Segway trick for Hubo, Asimo reportedly scoffed, "Honda has spent hundreds of millions teaching me to walk and run. I don't need no stinkin' scooter." For now, Hubo needs hep to get on or off the Segway but Oh says that he will be able to handle it all by himself after software upgrades.